Found flowering on wasteland unnoticed, unofficial, accidental"
Like many things in life, my weed fascination began in childhood. It all started with pineapple weed, Matricaria discoidea (pictured above, photograph by Arran_Edmonstone on Flickr). I was on holiday in Dorset when someone first demonstrated the pungent pineapple smell that comes from the crushed flower heads. I couldn't fathom why a weed would smell this good (still don't know the answer, can anyone help with that?). As a gardener, identifying weeds is crucial - you need to know what to keep and what to remove - but I've increadingly found myself taking this detective hunt outside the garden: when I am out and about I spend most of my time with my head down, checking out what's growing in cracks in the pavement. Why? I'm not sure. It's not always about foraging - although I did write a piece for Grow Your Own magazine last year on the possibilities of eating weeds. Sometimes it's just about the fascination of an odd name, like pellitory of the wall or shepherd's purse. And sometimes I just want to salute the tenacity of a plant that's managing to make its way in a hairline crack in a wall, like this ivy-leaved toadflax. So it was with great joy that I read Weeds by Richard Mabey recently. I'd lie in bed with the book in one hand and a weed identification guide in the other, cross referencing one to the other to work out what thornapple looked like and so on. He describes just the kind of expeditions I like, criss-crossing London's wastelands in search of weeds, some exotic interlopers, like the tree of heaven, and other more familiar (though ultimately no less foreign) sights such as the wonderfully named shepherd's purse. The planting of my green roof has only increased the fascination with wild plants, weeds, whatever you want to call them. I've already published a list of what's up there intentionally - what will be fascinating is to see what arrives under its own steam. Two things have bolstered my desire to reconsider weeds and their worth in and out of the garden: first, VP's recent post over at Veg Plotting about the delights of a verge full of dandelions, and second, the reading of Anne Wareham's new book The Bad Tempered Gardener, in which she insists we must look afresh at plants and throw away our prejudices and preconceptions about them - in her case, ground elder and variegated ground elder (the latter of which I already grow myself). It's not always about the foraging possibilities of weeds, but often it is, and my other recent read, Stalking the Wild Asparagus by American foraging Euell Gibbons, has inspired me on this front (notwithstanding his obsession with making chiffon pies from absolutely EVERYTHING). One of my first missions after finishing the book was to make violet jelly - something I read about last spring but, heavily pregnant at the time, never got around to. This year I was ready, but had trouble tracking down the necessary quantities of sweet violets (there are a few dog violets thrown in here, you'll notice). A nifty bit of foraging by an army cadet hut produced a scant half-cup of blooms but it was enough to make half a jar of lovely lilac coloured jelly: given that Fortnum & Mason charge over a fiver a jar for the stuff, it wasn't bad going for the price of the sugar and pectin. The recipe's here if you want to try it for yourself. Next up, I need to find some Japanese knotweed to try out Gibbons' knotweed jam recipe and this vodka recipe from Andy Hamilton. There is something (hopefully literally) delicious about subverting something so demonised in food and drink, don't you think? I've been delaying and delaying getting a plant for my desk at work, but I am starting to regret that having started to read Dr BC Wolverton's book How to Grow Fresh Air: 50 Houseplants That Purify Your Home or Office. The author carried out research for Nasa looking at air quality in spacecraft and for potential lunar bases, in the process discovering that certain houseplants are brilliant at filtering pollutants that are rife in modern homes, such as formaldehyde, xylene and benzene. A range of health complaints are attributed to exposure to these pollutants, found in everything from particleboard to fabrics. Indoor air pollution could also be a major factor in sudden infant death syndrome, Wolverton says, as most new babies go into freshly-painted, carpeted rooms which are therefore full of pollutant emmissions. Yikes. Reading further about how efficient plants are at dealing with the likes of formaldehyde, it made me want to run out and buy a load of new plants for every room in the house right now. Dr Wolverton helpfully gives each of the plants he features a rating out of 10 based on removal of chemical vapours, ease of growth and maintence, resistance to pests and transpiration rate. The number one rated plant is the areca palm, Chrysalidocarpus lutescens, which he describes as "consistently rated as one of the best houseplants for removing all indoor air toxins tested". Other high scorers include the rubber plant, Ficus robusta, common-or-garden ivy (Hedera helix) and various members of the Dracaena family. I've already got several of the book's top 50, but I'm also aware I have no plants in my daughter's room or my bedroom - places where a bit of pollutant removal should be a priority, it seems to me. The top performer of the areca palm looks like a must-have, but they seem fairly pricey as they're usually sold as largish specimens of 1m tall or more, but I just spotted they have them in Ikea: a 120cm tall plant for £16.99. Sanseveria trifasciata, commonly known by by its un-PC title mother-in-law's tongue, only scores 6.3 on Dr Wolverton's scale, but fascinatingly it differs from most plants in that it produces oxygen at night rather than carbon dioxide - a good one for the bedroom perhaps? If you're one of those people that can't reall see the point of houseplants, this book is worth a read. If you're into houseplants already, it'll shed new light on your hobby. Just don't buy all the areca palms from Ikea before I get there, ok?! How fascinating. It's always revealing to find out how iconic images came into being. I emailed Bill back, telling him the poster can now be bought from the Imperial War Museum shop. I'd still love to put the Plots Against Hitler book on my blog, but still need to establish the copyright situation - perhaps I'll contact the Imperial War Museum to see if they can help. Will keep you posted. Mrs Be over at Carrots and Kids is yet again on the money in this post about how hard it is keeping your garden in shape at this time of year. And she knows what she's talking about when it comes to time pressure, with five children to my more manageable one. My excuse is that I move house in less than four weeks - so while the lawn will be mowed once more (possibly for only the third or fourth time this year - yes we do prefer the "meadow look" in my household) and I'll cut back the ivy threatening to engulf the neighbour's garden, but beyond that, my time is going to be taken up packing and conducting bad-tempered calls to utility companies for the next few weeks. I have, however, been daydreaming about my new garden and plans thereof, and continuing my project to read the entire works of Christopher Lloyd and Margery Fish (as an aside - how did Margery fail to throttle her know-it-all husband?). They both beat anything from the last few years into a cocked-hat writing-wise, and are providing much food for thought in terms of planting for my soon-to-be 70ft north facing plot, but how did we cope before full colour photography was the norm? Having said that, my own book wasn't exactly replete with pictures and that did well. What gardening book/s are you reading at the moment? A sighting of a fieldfare* while on holiday a few weeks back brought back happy memories of my days as a member of the YOC or Young Ornithologists' Club, the youth wing of the RSPB (now, sadly, rebranded as the far more prosaic Wildlife Explorers). I've always had a keen eye for spotting birds, and my interest was rekindled by reading the excellent book How to be a Bad Birdwatcher by Simon Barnes. But I'd like to lay my hands on a really good field guide, because while the RSPB's site is really excellent for helping you to identify birds from their plumage and call, that's no good when you're out and about. I can't count the number of times I've been on the allotment or out on a walk when I've seen a bird and wished I could check what it was. So, if you can suggest a comprehensive, compact guide to the birds of Britain, let me know in the comments below. For those of you following my investigation of whether I can scan a WWII pamphlet on allotments called Plots Against Hitler and put it on this blog, and the slew of comments that followed from readers, there's more news. PAG arrived in the post today and is not a government publication - it was printed in 1941 by the Northumberland Press - the author's Raymond A Cook. So I am pretty sure it's still well within copyright and so the scanning is a no-no - as a published author myself I'm fullly aware of the importance of copyright law, so I'll have to limit myself to a summary and the occasional snippet. It is becoming increasingly obvious that, amongst the plots calculated to bring Nazism to its knees, those measuring 300 square yards are destined to play an important part. Which reminds me, I am planning to put up on this blog a little chunk of my book on the tricky issue or poles, rods and perches, aka how allotments are measured. This should fully explain the importance of the 300 square yards reference. Very occasionally - probably because my day job is being a journalist - I get sent new books to read in the hope I'll review them here. The latest of these is Bringing a Garden to Life by Jenny Steel. It's both the story of the creation of the garden at Lower Blakemere farm, home to the wildlife gardening company Wiggly Wigglers, and a guide to creating a haven for wildlife in your own garden. It's a beautiful book, packed with images of the many and varied creatures and plants that thrive in the garden, but it's also packed full of information on how to make your own wildlife garden. There are chapters on making a pond, hedges and orchards, meadows, and vegetable gardens - I've only had a chance to read a couple so far, but I've already learned lots. 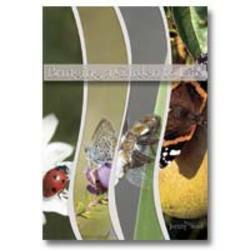 There are also freestanding pages sprinkled throughout the book focusing on "feature creatures" and "focal plants", which look at everything from barn owls and great crested newts to lavender and dandelions. Take the teasel plant for instance, included in the book as a "focal flower". I was bought some of these plants in the spring and I've been fascinated by the extra birds they have brought into the garden already. But I had no idea that I can expect goldfinches in the late summer, feeding on the seeds, or that the place where the leaves clasp the stalk was known as the Bath of Venus, and the water that collects in it was thought to cure eye infections and get rid of freckles. My only quibble with the book - and it's a really small one - was that I found the typeface a bit irritating. I guess it's designed to chime with the "wiggliness" of the name of the firm, but I found it distracting from the photos and text. My dad found a copy of the 1973 publication you see to the right and gave it to me. I was reading it on the train on the way home tonight and it's a fascinating snapshot of the birth of the green/hippy/homesteading movement of the early 1970s. The text is a lovely eclectic mix of tips on everything from how to can tomatoes and how to forage for wild greens to the best way to clean silver and the debate over home births. Clearly this publication has a bit of a cult following in North America: it seems to be going more than 30 years later, too. It's written in a "down-home" style that's pretty alien to British writers and will bring to mind the Waltons more than anything. I'll bring you some of my favourite tips in the coming days but one of my favourite pages offered instructions on how to make a wool spool using four nails and a big wooden cotton reel, which brought back childhood memories of constructing long tubes of wool that weren't good for much.